ST. JOSEPH, Mo. (AP) — St. Joseph estimates that Missouri River flooding has cost the city around $1 million. JEFFERSON CITY, Mo. (AP) — Missouri's top Senate budgeter wants to set aside $8 million for flood recovery and prevention next year. ST. JOSEPH, Mo. (AP) — U.S. Rep. Sam Graves of Missouri is trying to give those affected by flooding in Missouri a reprieve from the approaching tax filing deadline. JEFFERSON CITY, Mo. (AP) — Missouri's top Senate budgeter wants to set aside $5 million for any needed road and bridge repairs related to flooding. CAPE GIRARDEAU, Mo. (AP) — Roads are beginning to reopen around Missouri as floodwaters recede across much of the state. OMAHA, Neb. (AP) — Several communities along the Missouri River continue to struggle to restore drinking water service weeks after massive flooding swept through the area. ST. LOUIS (AP) — Flooding along the Mississippi River is closing roads, inundating low lying areas and testing sandbag fortifications. MANDAN, N.D. (AP) — Four people were found dead Monday in what police called a "multiple homicide" at a North Dakota property-management business. MOUND CITY, Mo. (AP) — Slow-moving floodwaters have made their way to eastern Missouri, increasing the number of closed roads to more than 160. OFFUTT AIR FORCE BASE, Neb. (AP) — A spokesman says a flood-damaged U.S. Air Force base in Nebraska has returned to full operation after its runway was deemed safe. ST. LOUIS (AP) — Rain is adding to flooding problems in central and eastern Missouri even as waters recede in the northwest part of the state. CRAIG, Mo. (AP) — In the late 1800s, the first members of the Drewes clan came to northwest Missouri and found a land that looked like their own back in Germany. KANSAS CITY, Mo. (AP) — Rain is expected to prolong the flood fight along the swollen Missouri River, creating a second crest east of Kansas City. KANSAS CITY, Mo. (AP) — Floodwaters have begun to recede in parts of northwest Missouri, even as the surging Missouri River continues to strain levees as it makes its way downstream. KANSAS CITY, Mo. (AP) — Levees shored up by sandbags are holding back the flooding Missouri River east of Kansas City as high water levels make their way downstream. PIERRE, S.D. (AP) — Authorities say they've found the bodies of two men whose garbage truck was found in a flooded South Dakota river. KANSAS CITY, Mo. (AP) — Flooding has closed about 140 roads in Missouri, even as water levels begin falling along much of the Missouri River. MANDAN, N.D. (AP) — River ice jam flooding is impacting a state park in southern North Dakota. KANSAS CITY, Mo. (AP) — Kansas City residents are being asked to conserve water while the city's utility is dealing with the aftermath of recent flooding along the Missouri River. This year's round of Midwestern flooding is the worst ever at three locations in Nebraska. OFFUTT AIR FORCE BASE, Neb. 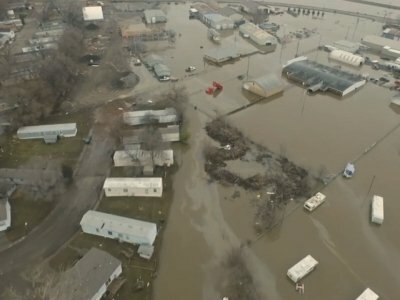 (AP) — Flooding has forced the Air Force to cancel the 2019 Defenders of Freedom Open House and Air Show at Offutt Air Force Base south of Omaha. DES MOINES, Iowa (AP) — Farmer Jeff Jorgenson looks out over 750 acres of cropland submerged beneath the swollen Missouri River, and he knows he probably won't plant this year. Flooding in Nebraska has badly damaged up to 500 houses in one county alone.